As a long-time consumer of pizza and pizza-related products, I want to tell you how successful I think your latest ad campaign is. Not only is it great that a company is finally listening to it's customers with such enthusiasm, but really it's something awesome when you are being so proactive to turn around customer dissatisfaction to such a degree. I'll be honest, Dominos was never my first choice when it came to delivery pizza. For years I gave my business to your competitors, but lately, as Dominos has been working hard to gain the trust of the American people, companies like Pizza Hut and Papa John's don't seem as concerned. Sure, they were both quick to jump on the $10.99 bandwagon that Dominos established with their new campaign, but what they didn't do, was start listening to their customers. As Dominos begins to turn around profits and pick business back up, Pizza Hut continued to be lazy and inconsistent. I can say that at least 3 out of my last 5 order from Pizza Hut were missing items. The pizza is usually cold and greasy. The people taking your order over the phone usually sound miserable and are rarely helpful. When I call Dominos, I'm greeted always by a friendly voice, and made to feel respected. 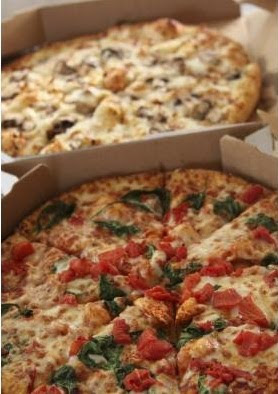 My pizza always shows up piping hot and looking delicious. The new recipe Dominos is using is also a big success. The pizza was never THAT bad, but now it's actually deserving of being called really good. The sauce is tangy and light. The pepperonis are crisp and spicy. The new garlic butter crust is finger-licking good. Don't even get me started on the oven baked subs. They're scrumptious! So Dominos, I give you kudos. Your new way of doing things is definitely working from my perspective, and that being from a loyal customer, I expect, is what exactly what you want to hear. Check out the new customer interactive website, showusyourpizza.com! I've been a fan of Domino's for years, it was a regular choice for years growing up. We had the others as well, but Domino's just seemed better. I remember once ordering from Pizza Hut, and wanting an extra topping or somethig, but was told it wasn't possible because their pizza's are premade....wtf. Anyway, I also enjoy the new sauce, seems a little spicier to me, which is good. And can't beat ordering online and tracking your pizza from when it's being made to when it's delivered to your door. Here in the UK, Dominos and Pizza Hut are really the only main Pizza places. I always like sitting in the Pizza Hut restaurant but if its home delivery I always plump for Dominos. Especially on a Tuesday when its buy one get one free! Sadly, I don't think we get as good pizzas as you lot in the US.